What keeps motivating you to stay active on steemit ? My first semi-serious attempt at online content creation started sometime in 2004, when I was 16 years old. I created and maintained a (now defunct) blog about gaming news. 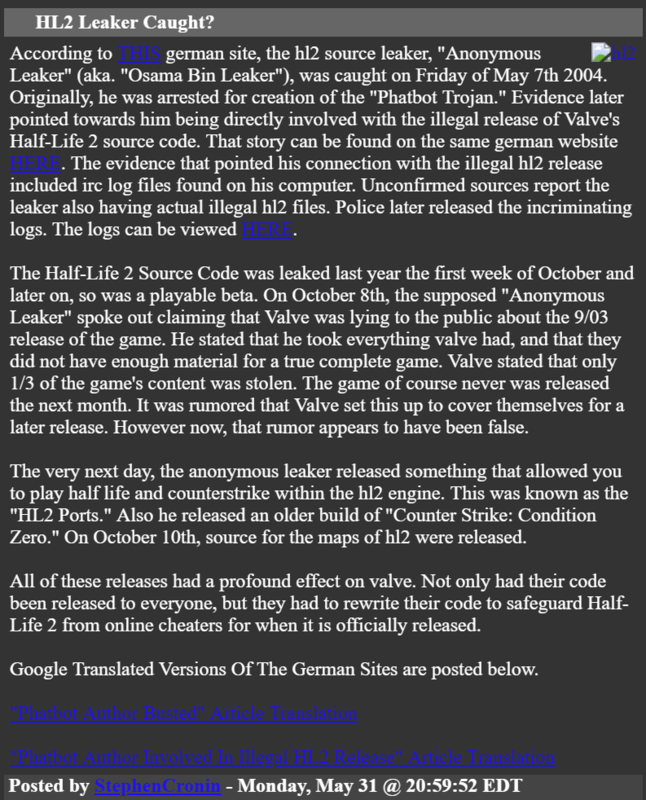 The first post to actually get some attention was regarding a leaked build of Half-Life 2 (available via Torrent way before release) that a hacker obtained and distributed. When I discovered the leak, no news outlets I could find (that wrote in English) had published a story about it, so I was probably one of the first to break news only known by underground fileshare bandits. After tiring of blogging and getting distracted by things like college, I started my YouTube channel in 2008, gained over 20k subscribers, got referenced in news like VICE, etc. However, eventually (as most of us know) the censorship kicked in and my years of work had been lost. Now, I'm creating content on the blockchain. In a way, it's a bit nostalgic because the products (like Steemit) are very new - and kind of remind me of blogging in 2004. I'm currently using A LOT of content creation dApps for various purposes (not just Steemit) like Scorum, DLive, Trybe, etc. And, eventually, I'll settle on my favorite platform with a solid niche. 1. Supporting & Advocating decentralized social media to fight censorship. 2. Actively being a part of what might be later known as the Blockchain Revolution. I was too young to do anything productive when the Internet was gaining popularity. The first website I navigated to was in 1997: StarWars.com and I was 10 years old. I have been slacking off on Steemit.com. On the other hand, right now my biggest motivation to stay active in the Steem ecosystem is musing.io. So I may not be active on Steemit but I am definitely posting answers through musing. The fact is that musing has been a great learning experience for me. For this the reason is simple - To effectively answer a question, I need to first read and research about it. This has helped me improve my knowledge in just the past few weeks alone. I wonder how much more knowledge I would gain, if I stay here even longer. I should also mention that musing.io has been very generous to me with their upvotes. Obviously, I try to do my best to create 'question-answer' content here, but musing has been a great place get rewarded for my efforts as well. Steemit, the steem blockchain, cryotocurency as a whole, has such a vast and promising potential that seriously you cant have that knowledge and be elsewhere and your mind would be at peace. So steemit just makes it easier and more amazing for me to tap into the essence of this awesomeness, and make a few bucks from it! There's nothing more awesome I tell ya. Honestly I think most times we underestimate how fun steemit is. Forget the fact that it is a social media platform- - and this in itself brings alot of added layers of fun of course- -but let's forget this for a moment, the fact that the platform is highly incentivized means people get passionate, and you know what happens when people get passionate! Fireworks! I'm lucky enough to have made quite a few friends on steemit. And I'm talking awesome awesome friends who sometimes are even more awesome than my real life friends. I get to relate with people from all over the world and i honestly wouldn't trade that. So even if steem falls back to 10 cent or even zero out, odds are I'll probably still be here. Kicking it with ma buddies. One of the places i made most if my friends here on steemit is in a place called Curie. It's sort of an organization/ guild that handles massive curation on the steem blockchain. What they do is they help to discover relatively obscure and under rewarded authors who are contributing tangible original content here on steemit. I might not be a whale and my upvote might not be substantial, but I could at least take solace in the fact that while as a curator for curie i could discover these exceptional authors and artists and bloggers the blockchain has to offer and help them get the rewards they deserve. I cant name a lot of feelings more satisfactory than this! This is probably one of the most important. As a writer or artist one needs a outlet for one's thought. Steemit is this for me. It's easier for me than starting a website or using WordPress cos I'm extremely lazy. And like i said there is also an established community here ready to engage with your work. Plus it also incentivizes engagement! Its like everything i need on a platter of gold to be honest. Haha if I'm going to be honest with myself i think another reason I'm going to keep being active is because I've become somehow addicted-- but in a relatively milder healthier way. All reasons listed above are probably to blame. Cheers. It's the growth and development of the DApps that keep me motivated to stay active on the Steem Blockchain. Personally, I no longer use Steemit.com, the frontend interface and blogging platform that most Steemians. However, when it comes to the Steem blockchain, I am still motivated to stay active here because of the strong growth and development taking place among the DApps. In fact, without these DApps, I wouldn't even bother being active in the blockchain anymore. First, the DApps keep me motivated because they provide me with different ways to interact with the blockchain. Let's face it, sometimes blogging can be boring and bothersome. If Steemit.com was the only way to get me to interact in the blockchain, I would have given up on it now. After all, it can be monotonous if all I had to do was blog and comment everyday. At some point, unless you are a professional blogger, you will run out of things to say. Not to mention the lack of interaction you get as a new Steemian. However, because of DApps, I have found other ways to interact with the blockchain, which i find more fun and challenging. These activities include buying and trading cards on Steemmonsters and Peakmonsters, curating and discovering product hunts in Steemhunt, and answering interesting and challenging questions here in Musing.io. Thus, because of these DApps, I am no longer confined to just blogging on the Steem blockchain. I can find other things that interest me, serving as a more useful motivation to stay active. Second, the DApps also help motivate me to stay active because they have provided new and more ways for me to keep earning on the blockchain. If we're being honest, most of us discovered the Steem blockchain because of it's earning potential. However, recent developments have made it more difficult to earn by blogging on Steemit.com. Thankfully, the growing number of DApps, has changed this by introducing new ways to reward users on the blockchain. Some of these DApps include Actifit, which rewards users for their fitness activities. There are Steem-based games that give upvotes for playing them. There are also DApps that reward with upvotes for using them as frontend interfaces to publish posts. And of course, there are DApps like Musing.io, which rewards users for asking and answering questions. Because of these DApps, users are able to find new ways to earn in the blockchain. Finally, the DApps also help me stay motivated because their growth and development show that there is a real huge potential within the blockchain. According to SteemProjects, there are currently 442 DApps being developed within the blockchain. These DApps include projects, tools, websites, services, API clients, bots, and other initiatives, which only goes to show that the Steem community is growing at a healthy rate. This is an exciting development, because it points to the blockchain's huge potential. And if we consider that these developments took place even before SMTs launched, means that there is more to come for the blockchain and the users that stay active on it. So, as long as the DApps like Musing.io and Steemmonsters keep growing and improving, I will stay motivated and active on the Steem blockchain, because while it might not be obvious now, these DApps are the future of the blockchain. I’m always motivated. Haha. Not that I always get the support. Not only for that. I used to keep writing small posts on tumblr for free too. Never a good writer/photographer or anything, just to keep track if life/travels. So I don’t mind how much reward I get for a short post on Steem. But I think lack of readers is probably the most possible thing that keeps people motivated on Steem, plus seeing too many trashy posts getting far more rewards than themselves might also be the reason. Funny enough is that they don’t seem to mind getting far fewer likes on instagram compared to some popular instagrammers. This is a great question. There were many times when I first started on Steemit that I thought to myself, "why am I here". Rewards were few and far between and it was hard to get recognized. Who am I kidding, it is still hard to get recognized and with the price of Steem being so low, rewards are still pretty sad. I really believe in the platform though and although it isn't necessarily what I thought it was going to be when I joined, it has become something even better for me. Never would I have guessed I would have a place that could be an outlet for my writing and other areas of my life that generally take a back seat to me doing my real job so I can pay the bills. Many times when I am feeling unmotivated or down about Steemit, I will just take a day or two off from the platform. It is important to refresh your soul and regain your peace before you try to push ahead. After those couple of days, I can always come back to Steemit with a fresh outlook and perspective. Even if I am struggling with content, there are always the connections I have made on Discord to give me inspiration. Besides taking a break, Discord also keeps me motivated to stay active. There are so many great initiatives happening and I have a great group of people following me that I can interact with outside of Steemit. They help keep me on track and give me ideas and insights on what I can be posting about. It seems like every day there is a new project being developed on the Steem blockchain. As a group we keep each other up to date on what new and exciting dapps are being release and which ones are worth checking out. There is always something new happening on Steemit and that is what will always keep me coming back to it even if I need a short break. The Spirit to move forward. As many things are happening in Steem Blockchain for now it is hardly possible to keep track in Steemit alone. Like most of the users say Steemit is not alone in Steem Blockchain. All the dapps that are being built in Steem Blockchain are sure attracting a lot of attention. While as they are in early stage collecting their token is one of the most priority to many Steem users. While Steemit is indeed a beautiful platform, most of us has started our Steem Journey through it by blogging and yet many of us are still here and we are loving it. The users who are continuously supporting other users and their content quality made me focus on my own and how should I do more to make my content more of quality. The Community and the support from them were indeed immense and that is something that I will never forget. Now the Upvotes from the generous users of Steemit really made me go ahead and keep on doing the things that I do best. While at last the team of Steem Blockchain and their work for the coming days are really appreciated by the users and in the coming days we sure will see the fruits of our hardwork. So these are the few things that kept me going on Steemit. Its being legit keeps motivating be to stay active. I have been working online for years and it is not easy to find a legit site and there are lots of scam sites in the web. So if you found a legit site, better to stick or stay to it especially if you are growing on that site and it is beneficial. Aside from being legit, I could say that Steemit helped me to learn more about cryptocurrencies and not just Steem and SBD. I have learned how to do trading or use exchanges as well. I also believe that having Steem power is a good investment as its value could be high again and that means more gains. Steemit is a social platform with a difference. It brings bloggers, business personnels and professional under one platform. It gives bloggers audience for their work and give them the possibility to earn. While it also gives the business guys and professional guys the opportunity to share their expertise and also earn by investing etc. Steemit is a hard place to stay motivated. Every day is a struggle. The motivation that keeps me going is the social side of it and the rewards . If you see it as a game and the more powerful you are the more you can do. I watch the progress of my account growing and that spurs me to carry on doing more. There are a few sites like Steemworld.org and Steemdb that show your growth. Steemdb has a graph which tracks how you are growing which I find encouraging and helpful. In the future Steem will be holding some value and the more you grow now the easier it will be. Can you imagine if there are a few million users on here how difficult and scarce Steem will become. The time is now and that motivates me more than anything else. A personal goal to have made 1000 SP by January 01, 2022. Three years is around 1000 days so just doing a few things every day to earn SP adds up toward that goal. I guess the question is *What keeps motivating you to stay active on steem blockchain? * The only time I spend on steemit.com is to transact in my wallet (I wish other platforms on the blockchain can have that option). My time on the blockchain is spent mainly on Steemhunt this days, review products and curating interesting 'hunt'. And I plan to spend some time on musing.io too, I hope I find the motivation to stay here. How do we Know that humans are the major cause of global warming?Why should I vote a witness?Who should we love between mother and wife?How do you educate naughty, stubborn, and unruly children?What's the best way to make posts go viral on Steemit?What is your worst memory in a hotel?Would you accept that women were priests in the Catholic Church?When you're stressed, what do you do to conquer it? ?What are the benefits of meditation ?Is religion a necessity ?